Sources: IISD summary, with additions from 55th Council documents and participant notes. The ICCA Consortium joined Global Environmental Facility (GEF) CSO Network members at the 55th GEF Council Meeting and, CSO consultation held in Washington D.C. (17-20 December 2018). The 5th ICCA Consortium Policy Brief (“Whose Inclusive Conservation?”) was prepared and circulated in advance of this GEF Council meeting. It notes that the term ‘inclusive conservation’ is used in the GEF 2018-2020 programme. It welcomes the focus on inclusion, while also highlighting the widely divergent views of what ‘conservation’ is and should be and, likewise, by and for whom it should be undertaken. The Brief then proposes a definition of ‘inclusive conservation’ and specific recommendations for legislators, policy makers and other conservation actors willing to pursue it. The Consortium engaged in the 55th GEF Council meetings in part to continue constructive dialogue and action towards conservation approaches in line with these recommendations. The GEF Council meeting was preceded by a CSO Consultation, which included representatives from civil society, GEF Council and Agencies, and the GEF Secretariat. 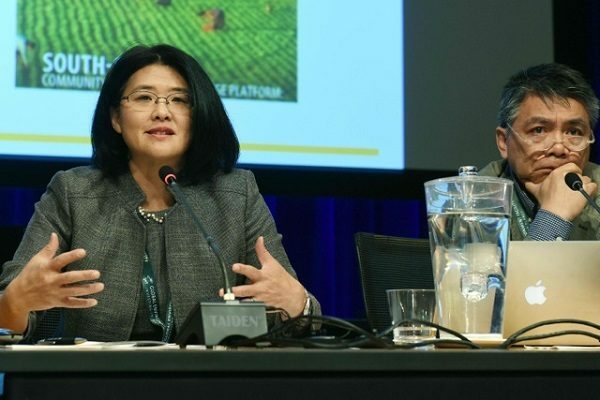 In her remarks, the GEF CEO and Chairperson, Naoko Ishii, referred to the findings of two recent scientific reports on the rapid rates of climate change and biodiversity loss. She suggested that the GEF-7 programme offers critical pathways to address these trends, and highlighted the role of CSOs as change makers. Following a presentation on implementation of the Updated Vision to Enhance Civil Society Engagement with the GEF, panelists and participants raised several concerns, while also welcoming aspects of the Updated Vision. They noted, among other things, the need for stronger mechanisms and sufficient resources for CSOs’ and indigenous peoples’ engagement in GEF at national and regional levels and the need to respect indigenous peoples’ self-determination in decisions about who can attend GEF events. During a panel on CSO engagement in GEF-7, Yoko Watanabe (SGP), noted that the GEF-7 SGP will focus on “strategic partnerships/platforms for community-based actions; incubation of innovative solutions and risk taking; a focus on critical landscapes and seascapes for larger impacts; and a focus on social inclusion in maximizing global environmental benefits” (as summarized by IISDRS). During the same panel (on CSO engagement in GEF-7) Giovanni Reyes (National Coalition of Indigenous Peoples in the Philippines, GEF IPAG member, and ICCA Consortium Council Member) highlighted a GEF-funded initiative in which indigenous peoples in the Philippines are mapping their territories. He gave powerful remarks on the self-determined contributions of indigenous peoples to conservation, including in their ICCAs-territories of life, and shared the definition of ‘inclusive conservation’ proposed in the ICCA Consortium Policy Brief no. 5 (see above). His full remarks are shared in the link below. 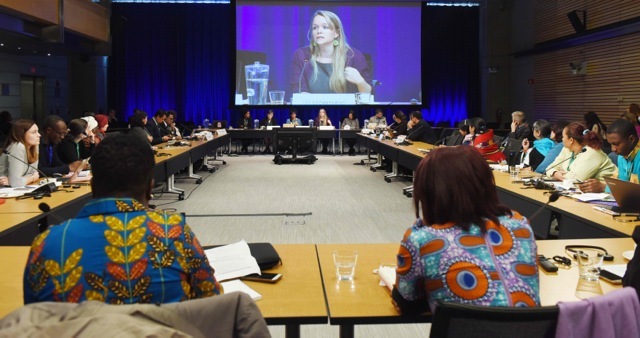 A large panel discussed connections between environmental conservation and gender equity, including the critical roles of women’s leadership and knowledge, as well as that of indigenous peoples and local communities, youth, allied men, and other community members. Panelists also spoke to the links between environmental sustainability, human health, and gender equity. They noted the need for GEF to proactively engage women, youth, and indigenous peoples and local communities, among others, including to learn from them. GEF Secretariat and UNDP then introduced the recent publication: ‘Women as Environmental Stewards: The Experience of the Small Grants Programme’. I’m Giovanni Reyes. I speak as member of the GEF’s Indigenous Peoples’ Advisory Group or IPAG for Asia. I’m also a member of the Steering Committee of the Geneva-based ICCA Consortium for indigenous peoples and President of the Philippine ICCA Consortium. Thank you for allowing me this opportunity to share with you the Philippine experience about the increasing role of indigenous peoples with GEF. We are grateful for the GEF-funded project and support for indigenous peoples community conserved territories and areas (ICCAs), through the Philippine Indigenous Peoples Community Conserved Territories and Areas Project or Philippine ICCA Project. ICCAs as we all know are areas within ancestral domains or lands, that are identified, protected, conserved and sustainably used by ICCs/IPs pursuant to their indigenous knowledge systems and practices (IKSPs) since time immemorial. The global ICCA Consortium describes ICCAs as “living embodiments of Article 8 (j) of the UNCBD” with respect to the knowledge, innovations and practices relevant for the conservation of biological diversity, and Aichi Biodiversity Target 11 with respect to Other Effective Area-based Conservation Measure or OECMs. Aside from translating traditional knowledge into its physical dimension in the form of maps, (that is to say, indigenous peoples interpretation of landscapes within their traditional territories are utilized in order to strengthen their community position of time immemorial ownership or possession), we also determine the state of health of forests and carbon content through systematic inventory of resources and documenting indigenous knowledge systems and practices at project site levels. b.4 To serve as basis for national and international reporting and monitoring on progress and impacts of biodiversity conservation. Pending the formal establishment of the National ICCA Registry, we have meanhile made arrangements to have our documented ICCAs registered with the UNEP-World Conservation and Monitoring Center (UNEP-WCMC). The registered ICCAs at UNEP-WCMC are complimentary to the Protected Area Registry. Besides, we see the entry of Philippine ICCAs in the UNEP ICCA Registry as a means towards providing additional layer of protection for indigenous peoples. I make mention of the above for the reason that the registration of ICCAs has implications on Climate Change Adaptation policy because the information therein contains capacity for carbon stocks. d. Asserts governance of IPs over ICCAs that are overlapped by Protected Areas. Because of the project, what has been an issue of conflict is today an area of harmonization. In all these efforts, we assert that the role of CSO and government agencies are purely technical while Indigenous Peoples retain decision making through their institutions of self-rule. This is simply because traditional territories of indigenous peoples, where biodiversity is high, are not public lands and it has been that way since time beyond recall. On Inclusive Conservation: We take this opportunity to also welcome the inclusion of Inclusive Conservation in the biodiversity focal area of GEF 7 and appreciate GEF’s acknowledgement of the significant contribution of indigenous peoples to biodiversity. Our perception of inclusive conservation is that ‘Indigenous Peoples are the key actors governing, managing and conserving their lands, waters and other gifts of nature and as desired, invite others to collaborate with and support.’ This is opposite from the legacy of state-centric “fortress” approach of conservation where indigenous peoples are evicted without adequate safeguards and in violation of their individual and collective rights as peoples. Other such IKSP-based activities that strengthen governance and policy. Discussion and Council Approval of an Updated Policy on Environmental and Social Safeguards (GEF/C.55/07) which supersedes the 2011 Policy on Agency Minimum Environmental and Social Safeguard Standards (GEF/C.41/10/Rev.01). This Updated Policy includes a number of changes that put stronger emphasis on, inter alia, non-discrimination and equity, stakeholder engagement, involuntary resettlement, indigenous peoples and FPIC, and cultural heritage. It also introduces monitoring of GEF Agencies’ compliance with the safeguards. At the same time, the CSO Network identified a number of issues for clarity or strengthening, including ensuring that the review and monitoring of safeguards compliance considers both Agency policy and practice, and is undertaken with the full and effective participation of involved and impacted indigenous peoples and local communities. Both the GEF CSO Network and a number of Council members raised concerns with the definition of indigenous peoples included in the Policy (and the CSO Network also raised concerns with the definition of FPIC). (The full text of CSO Network recommendations is included in the link below). The CSO Network requested that their comments be considered in the guidelines for implementation of the safeguards, to be developed by a multi-stakeholder Working Group on Environmental and Social Safeguards in the coming months. The Updated Policy will be in effect July 1, 2019 (applying first to all new programs and projects submitted for GEF financing on or after that date). Discussion and Council Approval of the new Policy on Access to Information (GEF/C.55/06), which applies specifically to GEF Council information (as access to Secretariat and Agency documents is addressed under separate policies). This new policy aims to ensure that GEF Council information is made proactively available or disclosed upon request in line with clear time lines (with some restrictions, set out in the policy). The CSO Network recommended, inter alia, that the Policy establish the communication procedure and instruments for requesting information. Discussion and Council approval of the first Work Program of GEF-7 (GEF/C.55/10), which includes 18 projects in 25 countries. Discussion and Council decision that the next two GEF CSO Consultations will focus on CSO and CBO experiences in plastics management (June 2019) and a civil society perspective on illegal wildlife trade (December 2019). (See document GEF/C.55/05). You can also contact your GEF CSO Network Regional Focal Point (find them here). The GEF Secretariat noted that two CSO representatives will now be supported to attend GEF Expanded Constituency Workshops. These regional workshops bring together GEF focal points, focal points from the main Conventions (including UNCBD, UNFCCC, and UNCCD), representatives from GEF agencies, and representatives from CSOs to discuss country and regional programs. Information about applying for participation in these meetings in 2019 will be forthcoming from the CSO Network and the GEF. Guidelines for implementation of the Updated Policy on Environmental and Social Safeguards will be developed over the coming months. The Consortium hopes to be able to share information with members on opportunities to comment on these guidelines. As noted above, the next two GEF CSO Consultations will focus on CSO and CBO experiences in plastics management (June 2019) and a civil society perspective on illegal wildlife trade (December 2019). ICCA Consortium Members have rich experiences and insights they may wish to share in both cases, e.g., highlighting indigenous peoples’ and local communities’ leadership and contributions to combatting illegal wildlife trade and conserving wildlife. We will provide more information in the coming months about how you may be able to engage in these two meetings. Looking for more about the 55th GEF Council Meeting and CSO Consultation? The CSO Network welcomes the steps taken by the GEF to improve the existing safeguards policy, including on issues concerning the potential impacts of GEF projects on indigenous peoples, local communities, women, youth and vulnerable groups. We support the proposed decision to review agencies’ compliance with the proposed policy and to review and monitor their application of the safeguards. We also welcome that guidelines for application of the proposed policy will be updated, and encourage GEF to meaningfully engage indigenous peoples, local communities, and CSOs throughout their development and implementation, both within and beyond the multi-stakeholder Working Group on Environmental and Social Safeguards. Ensure that review and monitoring of safeguards compliance considers both Agency policy and practice, and is undertaken with the full and effective participation of involved and impacted indigenous peoples and local communities. Specify, to the greatest possible extent, the social and environmental risk thresholds beyond which projects will not be approved or funded and which justify the no-project alternative (4.b) and specify that GEF financed projects should not contravene applicable international human rights instruments, in line with the reference to international environmental treaties and agreements in Annex I, paragraph 7(b). Specify the responsive action that will be taken (including when and by whom) in the case of Agency, government, or other actors’ non-compliance with safeguards. Ensure safeguards are implementing in ways consistent with and complementary of the whole set of GEF policies, principles, and guidelines. Recognise and engage indigenous, traditional and local experts, particularly women. In the definition of “Restrictions on Land Use”, add “including territories, water and water resources” at the end of the sentence “restrictions on access to other common property resources,”. Proactively support opportunities and capacities for indigenous peoples, local communities, CSOs, agencies, governments, and others to claim rights and uphold their respective roles and responsibilities in relation to the safeguards, e.g., through information and knowledge sharing. Consider the project risks and threats to indigenous peoples’ and local communities’ own collective actions on conservation. Recognise claims to land or assets that are recognized or recognizable under customary law, in addition to national law. Ensure grievance mechanisms and other relevant intercultural processes respect and engage local and customary institutions. Consider emerging knowledge and experience on the potential impacts and risks of the use and patenting of genetic resources, and include safeguard protections against the impacts of ‘bio-piracy’. With regard to Adverse Gender-Related Impacts, recognise and address the risks for LGBTQ+ persons.